These are the cowboy boots of my life. All the years of scouring eBay, close but not quite. 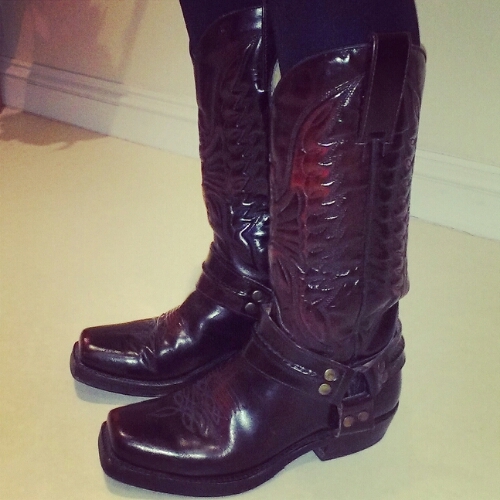 They are by Sendra – £200 worth of Spanish leather. For £16. I could WEEP. If you’re not into cowboy boots, you don’t know how hard it is to find a pair that look good. Like, ACTUALLY look good. So many variables: how tall they are, the shape of the toe, the height of the heel, the tightness of the leg. Very hard to find a flattering shape. And these are them. I’ve been searching so long, and here they are. An auction I thought I’d lost! Only to find them nestled in my basket, waiting for Mama to pay her bill. Loving my pink cat hat from Oasap – it’s so kitschy I may die of happiness. Also got some gold rings – triangle, circle and square – which I adore but (typically) rub green off on my fingers. Have overcome this by painting them with clear nail varnish. Such a girl scout. I got a collar as well: blue leopard print with spike studs. Yes. Yes it is good. Will post that when I can. So busy right now kids, lots of roller coaster activity going on. Job, freelance, life in general – it’s just all mental. Well guess what? My article about Royal Albartross on HOWL has led rather pleasantly to writing a few news stories here and there for the company. If you didn’t see that piece, Royal Albartross make the most beautiful golf shoes in the world. Now, I’m not golfer. But these shoes are to die for whether you’re a sporty type or not. Check out my latest piece for The Golf Wire, an American online publication. You are currently browsing the Flirting with Fashion category at Mutated Musings.